We’d love your help. Let us know what’s wrong with this preview of The Road to Hell Series Box Set by Brenda K. Davies. Now, I’ve never been closer to obtaining my goal, yet I find myself risking it all because I cannot stay away from her, a human who may be the key to it all. To ask other readers questions about The Road to Hell Series Box Set, please sign up. Wowza!! Davies not only gave me everything I had come to love in Good Intentions, but she turned up the heat and delivered a story full of passion, action, and intense feels. 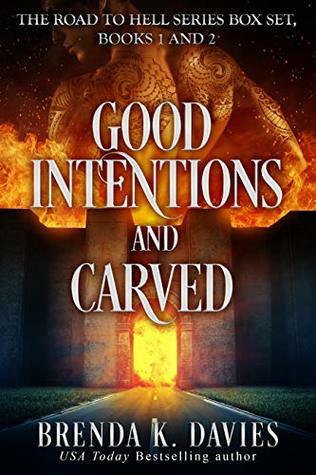 I didn't think I could love this story more until I delved into the heart of Carved. River has really come into her own. Although in the beginning she was full of doubts and self-recriminations and was pushing Kobal away, even if it seemed like it was for his own good, she finally learned to accept that she was more than she ever thought she was. She realized that she was far stronger with him than apart. He was her home. He was her connection to life. He was her true love. Her Chosen. As for Kobal, he never had a doubt. Not when it came to her. My entire existence had been about regaining the throne I'd never even sat upon, but I would lay down my life and let the next varcolac rise before I let something happen to her. Kobal trusted in River, maybe even more than she trusted in herself. He finally knew what fear was because he was scared of anything taking her from him. He was worried about the mission, about the cost that would be paid by River, and about her mortality. But his love for her, and everything that made her the love of his life, kept him from offering her eternal life. What if his gift to her took away her connection to all that made her good? She was so much more to me than my Chosen. This infuriating, powerful, stubborn, proud, loving woman was everything to me, and there was nothing I wouldn't do to protect her. Not what I expected for demons and angels. A good thing in my opinion. I generally gravitate away from the typical religious themed sort of stories so this was much more interesting to me. River grows fast during this first book. Kobal I am still unsure what I think of him. He is definitely a demon though. Anything to do with River and he has no control over his reactions. I am ready to step into book two.